SEATTLE — Seattle Councilmember Teresa Mosqueda wants the city to consider a new option in the fight against homelessness. On Thursday, she hosted a demonstration of a “pallet shelter” outside Seattle City Hall. The shelters are manufactured by Pallet in Everett and can be assembled without tools in 20-30 minutes. The structures can be outfitted with electricity, heat, air conditioning, and a locking door. She floated the shelters as a potential temporary housing solution. One of the units demoed Thursday sells for between $3,500 and $5,500, depending on selected options. With fold-down bunk beds inside, four people can sleep in one unit. “If we want to create stability for our community, if we want to make sure every family, worker, and individual has a place to call home, this a great first step,” Mosqueda said. 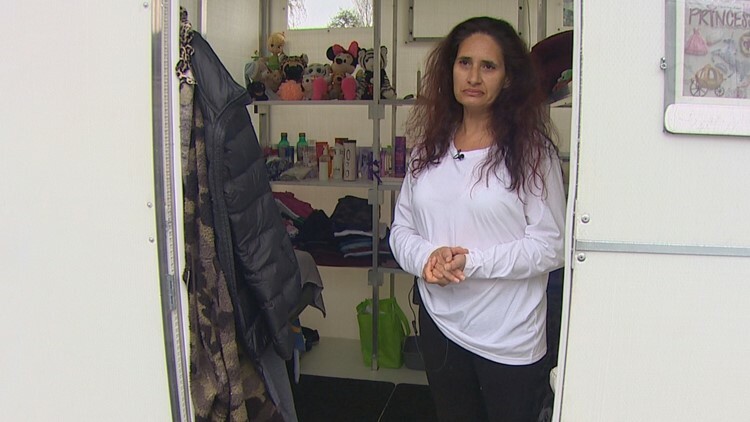 The shelters were originally built for disaster relief but are used to shelter some homeless people in Tacoma, along with a small camp in Lynnwood, Pallet CEO Amy King explained. “We want people to have the dignity of security and safety when they sleep so they can go out and work during the day and engage in activities they need to during the day,” King said. Six of the pallet shelters are currently in use at a small homeless camp behind Good Shepherd Baptist Church in Lynnwood. The Jean Kim Foundation sponsors the camp. Residents there moved into the pallets shelters from tents in November. Five of the structures at the Lynnwood camp are currently occupied. Dunbar noted that this is not a low-barrier housing situation. He believes the strict oversight of the camp has contributed to their success. Residents there are enrolled in college courses and are not allowed to have visitors. “These are working, absolutely,” he said. Tadesa Ensslin lives in one of the pallet shelters and said it was life-changing. “Get back on your feet, that’s what I’m trying to do,” she said. She’s now studying to be a nurse’s assistant or caregiver. Tadesa Ensslin stands in the doorway of a pallet shelter at a camp in Lynnwood. The goal of the camp is to be temporary. That’s what Mosqueda hoped Seattle would consider, in conjunction with services. "One of the things I think is important is that we keep out eyes on the prize in terms of creating affordable housing. In the meantime, we have got to think of every creative solution to get folks inside,” she said. Mosqueda said she hopes to study the pallet shelters used in Tacoma as well to learn more about how such a camp might work in Seattle. She floated the idea of utilizing unoccupied parking lots or land and hopes the city council could consider budgeting for such an effort in the coming months, without pulling money from existing services. She noted it could be similar to an enhanced shelter, coupled with access to hygiene and services. "This is a successful model that I know we can replicate in Seattle," she said.